When Kevin Rudd and Julia Gillard lost the confidence of their party, there was at least the sense that leadership change was a gamble. There is no such uncertainty in Tony Abbott's case. The polls have long favoured Malcolm Turnbull as preferred prime minister, even among Labor voters; over the past couple of weeks he has worn the role like a tailored suit. On the other hand, nothing in the way that Abbott has conducted himself since his exit from office makes people wonder if a mistake has been made. Despite his promise to keep from wrecking, undermining or sniping, he has gone on a farewell tour, where the only ones buying tickets are die-hard fans. Farewell tours create their own reality for both performer and spectators; it is a reliving of the past, a mutual denial of failed albums and scandals, and the melancholic conviction that things will never be the same again. Abbott appeared on radio shows hosted by Ray Hadley and Neil Mitchell telling party members to continue supporting the Liberals even through 'gritted teeth'. Andrew Bolt wrote a column about how his friend 'seemed too moral for the job' and that Australians had cared more about his image than his deeds. Rowan Dean followed suit: 'If (Abbott) stays in Parliament and carries out his duties as a backbencher with dignity and enthusiasm over the coming years, respect for him will grow dramatically.' Dean speculates that Abbott might return to lead should a Liberal Opposition be 'in dire need of a strong, unifying leader'. That's the thing with farewell tours — sometimes it sets the stage for a comeback, or at least some sort of rehabilitation. Australia already has a long line of prime ministers whose standing seems to have been propped up over time. Edmund Barton, who oversaw the passage of immigration restriction laws, was an unalloyed racist: 'I do not think that the doctrine of the equality of man was really ever intended to include racial equality.' For him it was self-evident that non-white people were inferior. Many Australians favour a 'founding fathers' narrative of federation rather than wrestle with such unpleasant views; unless of course they agree with them. There are also those prime ministers who were reviled during their time. Gough Whitlam was seen as overambitious, but his ambition is now recalled in terms of the social structures that lifted generations out of mediocrity. Malcolm Fraser cast a long, bitter shadow due to the way Whitlam was sacked, but became something of an elder statesman, criticising punitive policies on asylum seekers and refugees. Paul Keating is now regarded as a kind of political compass, despite the fact that he was a shamelessly divisive figure in his day. Even John Howard, for all the rancour that beset his final two terms, is now better seen in terms of the benefits that flowed from the GST and gun reform, as well as his deft management of Cabinet. Similar distillation seems to be underway for Kevin Rudd and Julia Gillard. 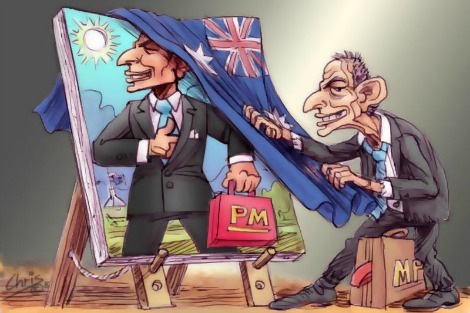 There is no doubt that Rudd's timely engagement with the US subprime mortgage crisis insulated Australia from the steep economic decline that hit other countries. There is also no doubt that the Gonski funding report, the Royal Commission into institutional child abuse, carbon emissions pricing, and the national disability insurance scheme will eventually cast Gillard as a reformist leader. Nearly all Australian prime ministers, and especially recent ones, are stained by immigration laws that they passed. But on balance, these examples indicate that legacies can't be spun. Whatever prime ministers do or don't do during office is no longer theirs to frame or reconstruct when they leave. Their policies and rhetoric are automatically ceded to history for judgment. Moreover, the passage of time tends to extract the essential parts of a prime minister's stint. They're usually those parts that give us a larger sense of national capacity. This is how complex figures like Whitlam, Fraser, Keating and Howard end up being rehabilitated in collective memory, to varying degrees. It's hard to tell, though, whether there is enough complexity in Abbott and his time as prime minister to enable such restoration. Meanwhile, we can hardly blame him for hitting the road and hitting some tunes with the old band. That's also the thing with farewell tours — they are comforting. Fatima Measham is a Eureka Street consulting editor. She tweets @foomeister . We thought we were in Heaven after Howard and we are just getting over talking about Kevin when it was back in 2007. Julia lost the vote to Kevin in 2013 when Bill changed horses and the horse-sense after that tale in the main was about Tony but now there is Malcolm and he is just so handsome. I just can't get over it when we have such a ring of confidence in our leaders. The title of this article made me curious. How can Abbott ever really be rehabilitated in the public imagination when he was so one-dimensionally negative? I see the author sort of agrees with my rhetorical question: you probably can't. This is an interesting and good article and as usual, very well written. Effective Opposition Leaders who highlight what they see as inadequacies of the Government do not necessarily make good leaders of Government. There is a difference between telling people what is wrong and being able to fix it. Surely Abbott forfeits any right to rehabilitation by his stance on one single issue: he would prefer the representative of a moribund and corrupt system, a foreign monarchy, as our head of state. In speed reading Fatima's article I didn't see Bob Hawke mentioned. Was that because he rehabilitated himself while in office after his tumultuous trade union career? Thanks Fatima. Informative article and historical references helpful. One thing - GW Bush was vilified for "Mission Accomplished" and attack for "weapons of mass destruction" in Iraq. Tony Blair likewise went through a similar process. But John Howard, the "man of steel" and the other culprit has never been referenced for his part where he even claimed he had discussed the issue with Cardinal Pell, who said nothing? We are still paying for these actions. Paul Keating was not “shamelessly divisive" in his day; quite the opposite. He brought the unions and businesses together with the Accord. Previously there had been disruptions as a result of strikes and wage freezes. Once PM he was determined to introduce social policies that included those who were disadvantaged, especially Aboriginal people. Social and economic policies require a better analysis than your potted history and glib observations. I will now happily unsubscribe from your blog that should provide a better standard of commentary. Whatever Tony Abbott's shortcomings, they were certainly fuelled ten fold by the media, like no other politician. Being a very decent, moral man who went about his business of being PM with a pack of media wolves baying for his demise every day of his leadership....I say God bless and good luck Tony, for showing us that we do still have people of backbone in Australia, who aren't just in it for themselves....You will be recognised for the good you did for Australia and the decency you are showing when faced with the humiliating position of being thrown out of office for what...popularity??? And such negative comments from so many. Unfortunately good people are often the last to be recognised....but he who laughs last laughs best! I have absolutely no doubt that history will not look upon the Prime Ministership of Tony Abbott kindly. His achievements are virtually nil - very little positive, and mainly undoing certain things that previous governments had done. Or trying to (with many things not flagged before being elected.) When you look at his leadership, he presided over a government that almost made the Whitlam Government look visionary, disciplined and effective by comparison. And his notorious "captain's calls".... I, like the vast majority of Australians, breathed a sigh of relief at his parting. But it is clear from Saturday's Liberal Party gathering that Malcolm Turnbull is anything but secure. The people want him. But his party, like the US Republicans hijacked by right-wingers, is no longer the "broad church" Turnbull tried to tell them they were. I know - I was once a member - a Liberal "wet". It now bears no resemblance to the party I was in 20 years ago, and especially not to the party of the Menzies era. I personally think the only thing that will purge the nutty right will be a catastrophic defeat - which Abbott was leading them to. After Saturday, that may still come. I like your term 'enough complexity in Abbott'. Its very worrying to see the mediocre standard of PM'ery these days. Seeing people like Mark Latham implode in the media we can be pleased with what might have been but sadly we are not seeing statesmen nor deep thinkers coming forward to lead our country. Part of Rudd's legacy should certainly be the Apology, yes? I will always remember him as the first PM with the moral and political courage to state the obvious and necessary; something Howard fled with all his might. "the first PM with the moral and political courage to state the obvious and necessary ...." The Apology was a marvellous thing, but Keating's Redfern speech shouldn't be forgotten: "It begins, I think, with that act of recognition. Recognition that it was we who did the dispossessing. We took the traditional lands and smashed the traditional way of life. We brought the diseases. The alcohol. We committed the murders. We took the children from their mothers. We practised discrimination and exclusion. It was our ignorance and our prejudice. And our failure to imagine these things being done to us. With some noble exceptions, we failed to make the most basic human response and enter into their hearts and minds. We failed to ask - how would I feel if this were done to me? As a consequence, we failed to see that what we were doing degraded all of us." Yes, well after the examples highlighted by Brian and Russell, what could we suggest as memorable speeches by Tony, other than 'nope, nope, nope' and 'they're coming to get us'. Absolutely nothing good came from Abbott's leadership. Was he dumped because he was too conservative or because he was only seen as such? He stopped the boats on the principle that a nation's borders cannot be porous. Good. That's 'conservative.' But, concerning easier issues, he talked, not walked. The knighthood to Prince Philip was precisely the opportunity for a prime minister who once led a pro-monarchy movement and wrote a book on the subject to tell the electorate from his bully pulpit why the monarchy is relevant to contemporary Australia. Instead, his response to the hoo-hah was a lame "perhaps-it-wasn't-a-good-idea." A hostile Senate? Today, a PM can have his own Youtube channel, paid for by his party, to do the Reaganesque thing and talk directly to the people. Don't tell them that gays are 'challenging', tell them that the nature of a gay marriage challenges a child by distancing it from one of its natural parents. In the Christian narrative, to which Abbott belongs, Lazarus is revived from the dead and Christ tells Peter that once he has recovered, to confirm his brothers. Churchill and Menzies were Lazaruses and when Abbott has recovered his faith, return, like his heroes, from the dead to confirm his brothers. Abbott is a good man much maligned by the media. Fatima you are too too kind all round. Whitlam's so called reforms have resulted in a dsigraceful, dysfuntional health"care" system, including especially that marker of wealth & social class - DENTISTRY, or lack thereof - (that's a deal done back in the day crying for a whistleblower!) and a university system, on the edge of privatisation and serving a far more priviliged section that was ever the case when I was at Melb University in 1968-72. Keating - Whitlam only said he was great treasurer because Goff knew nothing of economics! I dont know whose minds Howard has been reappraised as good in. Gun buy back was a show, that's all. If you were a gun owning crim would you sell govt your best guns or off load some outdated crap for good price to them? I fail to see any advantage the GST has brought me. Fraser suffered a more seriously and effectively vicious press than any I've seen since. Gonski, even if activated, made no serious inroads into educational inequality and disadvantage, a sop thrown to the party faithful.